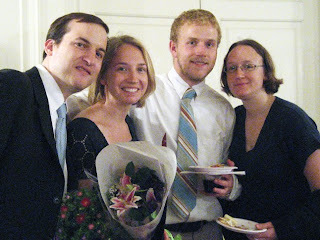 Family and friends filled the Ackerman library on July 24th when the Institute hosted its 2008 graduation ceremony. Seventeen externs took part in the celebration commemorating each trainee’s completion of the Ackerman Institute Core Curriculum. Trainees who complete the full Core Curriculum enroll in the Foundations in Family Therapy course and then participate in Live Clinical Supervision and the Clinical Externship in Family Therapy. Upon completion of the Clinical Externship, each trainee receives a certificate at graduation and an invitation to join the Ackerman Alumnae/i Association. This year’s graduating class was divided into three groups: Rachel Berezin, Andrea Blumenthal, Scott Hirose, Anita Mambo and Bonnie Siegel, supervised by Evan Imber-Black, PhD; Dana Greco, Jodi Harrison, Andrew Koncz, Keren Ludwig, Margaret T. Ngunang and Sarah Robinson, supervised by Miguel Hernandez, LCSW; and Wendy Bond, Kimberly Hope Andron, Karen Murphy, Genevieve Shineman, Orly Toren-Gabay and Jan Weiss, supervised by Fiona True, LMSW. Lois Braverman, President of the Ackerman Institute, welcomed the graduates and their guests. Ms. Braverman also congratulated the externs’ families and friends. “At Ackerman, we believe that families are the greatest resource available to individuals coping with the complexities of modern life. We know that individuals’ problems are best solved within the context of family, and we also know that individuals’ achievements also happen within the contexts of families and communities that support those accomplishments,” she explained. Miguel Hernandez told his students that their dedication and hard work filled him with the same kind of pride parents feel in their children’s accomplishments. Fiona True said she often uses the metaphor of a pond in family therapy, but that her extern group had really sailed on an ocean. There were storms, she noted, but the externs made their ship seaworthy and took it to an “incredible place.” She congratulated her students for their shared commitment to learn and grow, their dedication to the families they treated and their great intellectual curiosity. Many of the students then spoke briefly, thanking the faculty and staff at Ackerman, as well as their own families and friends for their love and support.